Brooks, John.（1969）. Once in Golconda: A True Drama of Wall Street 1920-1938. New York: Harper & Row. ISBN 0-393-01375-8. Galbraith, John Kenneth.（1954）. The Great Crash: 1929. Boston: Houghton Mifflin. ISBN 0-395-85999-9. Klein, Maury.（2001）. Rainbow's End: The Crash of 1929. New York: Oxford University Press. ISBN 0-195-13516-4. Klingaman, William K.（1989）. 1929: The Year of the Great Crash. New York: Harper & Row. ISBN 0-060-16081-0. Rothbard, Murray N. "America's Great Depression"
“Part 1: What Made the Roaring ’20s Roar”, June, 2004, pp. 16?24. “Part 2: Hoover’s Progressive Assault on Business”, July, 2004, pp. 10?20. “Part 3: Roosevelt's Raw Deal”, August, 2004, pp. 9?20. “Part 4: Freedom and Prosperity”, January, 2005, pp. 14?23. Shachtman, Tom.（1979）. The Day America Crashed. New York: G.P. Putnam. ISBN 0-399-11613-3. Thomas, Gordon, and Max Morgan-Witts.（1979）. 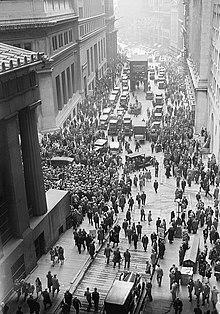 The Day the Bubble Burst: A Social History of the Wall Street Crash of 1929. Garden City, NY: Doubleday. ISBN 0-385-14370-2. ^ "U.S. Industrial Stocks Pass 1929 Peak" The Times 24 November 1954, p. 12. ^ a b Richard Salesman, Richard M. "The Cause and Consequences of the Great Depression, Part 1: What Made the Roaring '20s Roar" in The Intellectual Activist,　ISSN 0730-2355, June, 2004, p. 16. Emphasis original.